Gutters have one function: collect rain running off a roof and channel it, with proper slopes, to downspouts that carry the rain water to the ground and away from the façade and foundations. Even though they’re “out of sight and most of the times out of mind” for the majority of the time, gutters actually play a huge role in the structural integrity of any building. A clogged or leaking gutter can represent serious problems such as structural damages or health issues. Despite of this, most of the times it can be too easy to forget about them until something goes wrong – and at this stage the cost of any repair would be much higher than if a regular maintenance program was installed and problems were detected at an earlier stage. 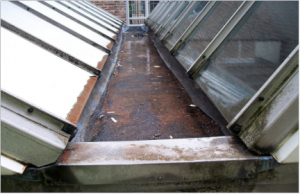 Experience show us that in most of the cases gutters suffer a quick deterioration, much quicker that the roof and the remaining of the building, requiring repairs or integral renovations in order to maintain its function for as long as the building service life. When defining solutions to avoid the need of gutter repairs, it’s important to remember one simple fact: clean gutters are far less susceptible to deterioration than blocked gutters. In fact, the two most common gutter related topics facing building owners are blockages in the gutter itself, and blockages in the downpipes. These blockages are often caused by debris like fallen leaves, moss and other developed vegetation, and (in some undesirable cases) dead animals. The specification and installation of a proper gutter system is key in order to avoid future problems. The choice of design, base material, and other particularities of the final solution, should take in consideration the project location, the gutter area of influence, and other aspects such as the existence of trees on the surrounding, otherwise it will not address properly the challenges to which it will be submitted during its lifetime, and will most probably fail prematurely. Improper location of downspouts, or not having enough of them, can lead to standing water and overflows during heavy rains. Standing water will cause among other: erosion, rust, siding damage and damage to the gutter support system and roof from excess weight. 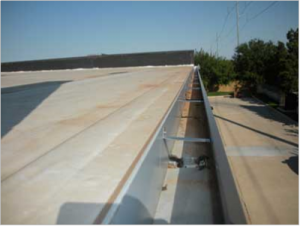 In order for water to flow properly, gutters need to be angled accurately. The slope should sit at the correct angle. Possibility of standing water should be completely avoided – standing water will promote a quicker deterioration of the gutter – no matter of which is the gutter base material. The most common problem we see with gutters is clogging. When gutters become clogged, they can’t drain properly and can start to overflow during rainstorms. When the water can’t flow properly, it can start to cause problems. That’s why it’s so important to keep gutters clean — the water must to be able to flow through easily. Clogged gutters cause water to stand and stagnate and often overflow. As we have seen before possible consequences of stagnate water are among others: erosion, rust, roof damage, siding damage, and damage to the gutter and roof support system from excess weight. Leaking gutter joints are another common problem: in fact, leaking gutters are one of the most common causes of isolated damp in building’s interiors. Leaks can occur when bits of debris get caught in the joints, or simply from general wear and tear. As in any situation joints are critical points, and special care should be taken when defining solutions for joints or with its maintenance. Gutter damage can happen by various causes – the most common being the weather. During a heavy rainstorm or windstorm, gutters can be knocked down or damaged. In this case, it might be necessary fixing them, or to replace certain sections. In this case, there’s not much one can do to prevent it, other than making sure your gutters are properly installed and aren’t already loose. For clogged gutters with debris, moss, and standing water, overflowing water isn’t the only problem. The extra weight can also cause gutters to sag. This is usually caused by loose hangers or hangers too far apart, which pull out when they can’t hold the extra weight. This can usually be fixed by simply tightening the screws again, or installing new ones, ensuring the necessary mechanical resistance. Corrosion on metal gutters will be a consequence for any of the problems identified earlier. It can also appear due to other causes: gutter sections are typically bolted together and this is where the problems start. 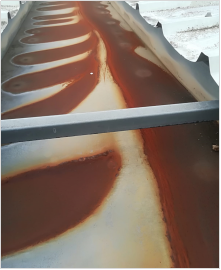 Fabrication and welding processes destroy the gutter coating requiring local post manufacturing treatment to restore corrosion resistance – most of the times this is not done properly and corrosion will start here. Also gutter systems are usually the first part of the building envelope to be installed after the construction of the frame. The result is that the gutter is used as an access way and / or storage area during the roof construction causing surface damage and wear even before building use started – at these points the material will become fragile and there is an increased probability for corrosion to appear. 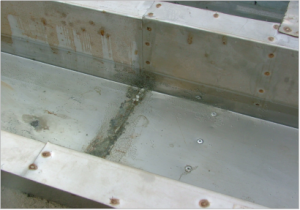 If left untreated, corrosion continues – it will continually eat into the surface, the exposed cut edge of the sections and the fixings. Failures in any system will always become evident at its weakest point, which in a gutter system is going to be the joints and changes of direction. Once corrosion has set in and a joint has started to fail, building movement, thermal expansion, freeze/thaw will further exasperate the problem. Once a joint has opened up it can be difficult to fix because of the build-up of dirt, debris and moisture around the opening. 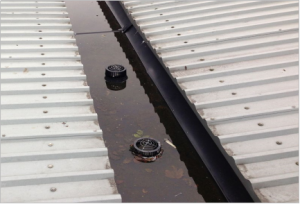 Industrial or residential rainwater gutter systems are designed to give many years of reliable service but to achieve this, a regular inspection and routine maintenance program should be undertaken. Prevention is always better than cure and establishing a regular maintenance program is the most effective way of ensuring that serious problems do not arise. In the course of collecting water, open rain gutters also collect leaves, acorns, pine needles, and other debris which can cause clogs anywhere in the gutter itself or sometimes in the downspouts. In dry conditions clogged gutters are a fire hazard; and during heavy rains, clogged gutters and downspouts can cause rainwater to overflow, potentially causing substantial damage to the building. To keep gutters free of debris, a maintenance program has to be defined. This might vary depending on the climate, but usually, it’s a good idea to maintain at least a twice a year program – clear them out in late fall after most of the leaves have fallen, and in spring to make sure they’re clear for some showers. 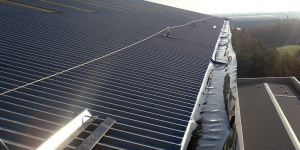 On locations where the existence of particularities that contribute to a higher probability and quantity of debris inside the gutter, such as for example, the existence of many trees on the surrounding area or the existence of seagulls frequently on the roof, it may be necessary to clean the gutter more frequently. 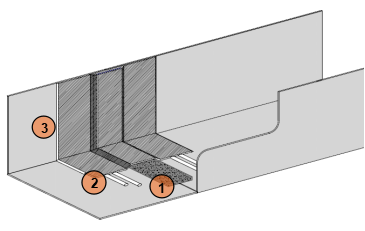 When simply due to age, or due to more specific causes such us improper maintenance, it might came to a scenario where a more deep intervention has to be considered: it might be the case for an intervention with focus only on the gutter joints, or some other specific points, or of an integral renovation of the gutter. The most common used solution for gutter repairs or gutter renovations are liquid Installed Solutions. The most frequent difficulties associated with such solutions are its limitation to handle movement – and movement on gutters can be quite significant. Usually such solutions, in order to function properly, need to be applied carefully: the correct thickness of each layer should be respected. The problem is that on such constrained area as a gutter, it is quite hard to assure that a specific thickness of material is being applied, and to maintain this same thickness at all areas where the material is being applied. Typically, if the thickness applied is higher that the recommended, the elasticity of the material will not be able to absorb the expected movement and it will fail; if the thickness of the material is lower than the recommended it will not have the necessary resistance and it will fail prematurely. If we analyze the offer for non-liquid Installed Solutions, we can find some solutions on the market with membranes, that are specifically promoted for gutter waterproofing. With membrane solutions usually the quality of the material and its performance is easier to control as this is factory controlled. The downspout of such solutions is that they usually require specialized tools for installation and very specialized labor. As conclusion we may say that there is a lack on the market for efficient, sustainable and easy to install solutions for gutter repairs or renovation. 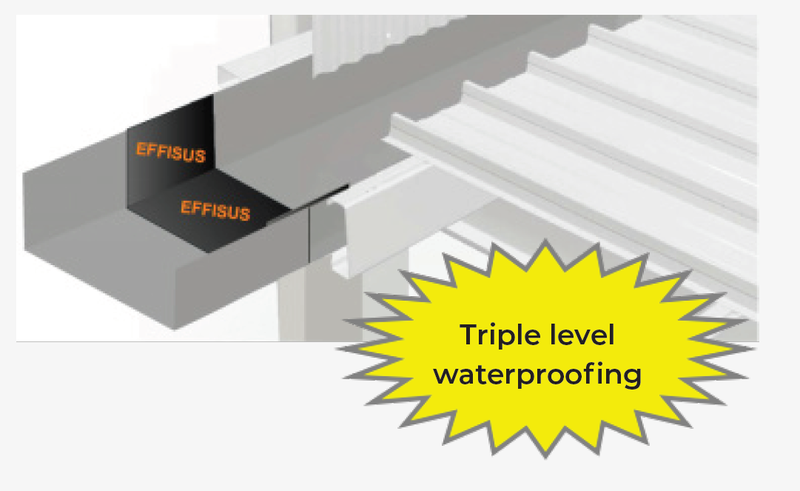 Effisus Titegutter3 is the innovative integrated system for sealing gutter joints. The system’s efficiency and added value are guaranteed by its three waterproofing levels. Their properties give it the capacity of accommodating joint movements originated by structural or thermal expansion. The system solves, in an efficient and sustainable manner, the common gutter joint sealing job. Due to its speed and ease of application, the job can be done without the need of specialized labour and its completion time is largely reduced. With Effisus Titegutter3, one can reduce the probability of human error, reduce application time and assure gutters’ waterproofness. Effisus AllTiteGutter is a waterproofing membrane for the repair of deteriorated gutters. It is a very flexible and self-adhesive EPDM waterproofing membrane, featuring state of the art technology, that brings everlasting sealing security to the most critical parts of the roof – gutters. A gutter is usually the first area of a roof to get seriously damaged. At the same time it is an area that is quite often difficult to repair with traditional methods or materials – there are limitations of spacing to work, sharp edges, high movements, etc. Effisus AllTiteGutter is the ideal solution to overcome such challenges and assure a waterproofing gutter, with an easy and quick installation method. 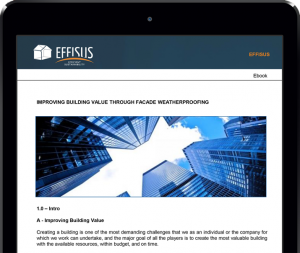 Details are quickly solved in conjugation with the Effisus Bond FT Tape. Interessante e innovativo, inserirò nei capitolati il prodotto. Our gutters have always had a bit of standing water in them, and I thought that was the norm. Your information that this actually causes faster gutter deterioration is really helpful. We’ll start looking into gutter specialists who can help us remedy our gutter pitch. Thank you for your feedback. 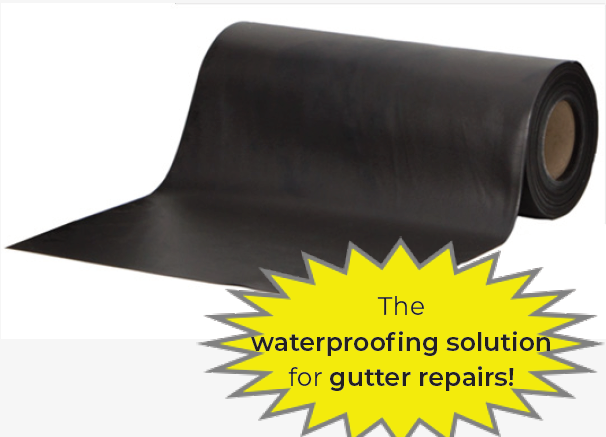 May we suggest you Effisus AllTiteGutter, a waterproofing membrane for the repair of deteriorated gutters. Effisus AllTiteGutter . Feel free to send us details to better help you.